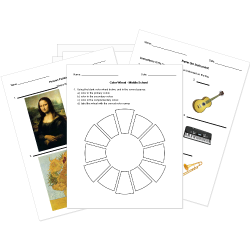 You can create printable tests and worksheets from these Grade 2 Arts questions! Select one or more questions using the checkboxes above each question. Then click the add selected questions to a test button before moving to another page. A self-portrait is when you create a picture of yourself. The pitch of music is how high how low it sounds when it is played. The dynamic marking "f" means . A whole note is held for 10 beats. Which time-signature has 4 beats in one measure? A whole note gets counts. Duration is how long a tone sounds. A half note gets counts. One eighth note gets a count.